Spark plug manufacturer and anti-parasite NGK Competition. At NGK Competition (we have separate standard NGK), you will find the ignition and suppressors of racing and premium spark plugs. NGK knows how to make high quality, a fairly huge choice for a very friendly price. NGK is very involved in the competition and motorsport and technical partner of the biggest teams in Formula 1, MotoGP, Moto2 and WRC Rally. The competition and motorsport are enrolled in gene NGK because they contribute to technological developments some products. The expertise developed for competition vehicles benefits the production vehicles that we use every day. 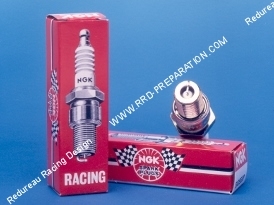 The range of spark plugs Racing Competition, after the competition of technology is particularly suited to vehicles requiring maximum power in the extreme conditions of motor racing.